I'm excited. Two of my favorite things - public radio and drinking beer from a jar - are marrying to make something even better. I'm excited. Two of my favorite things—public radio and drinking beer from a jar—are marrying to make something even better. It's called the Crawford Country MusicFest, hosted by WQLN and taking place all day Saturday, July 21, at Sprague Farm and Brew Works. The show starts at noon and goes until 10 p.m.
Y'all ever been there? If you have, you can understand my favoritism. If you haven't, trust me on this one, folks: you need to visit. The farm is located on Route 19 in Venango, Crawford County. And you can now catch 'QLN on the airwaves on your beautiful drive out. That's right, our public radio station applied for and received a new translator, which broadcasts at 19 watts, tripling the reach in the Greater Meadville area on 106.1 FM. "The new antenna is a project that has been in the works for eight years," says Tom New, director of creative services at WQLN, which broadcasts at 91.3 FM in Erie. "We are very excited about hosting a true American Roots Music concert in Crawford County, but the icing on the cake is our new translator." New believes Crawford County has just as much to offer as our Gem City, and I agree with him. "We always look north – Lake Erie is our jewel. Crawford County is just as great as the lake, but it's all farms and trees and great rolling countryside," says New. So WQLN chose Sprague's, 30 miles south of Erie, as the location of MusicFest for the second year in a row. 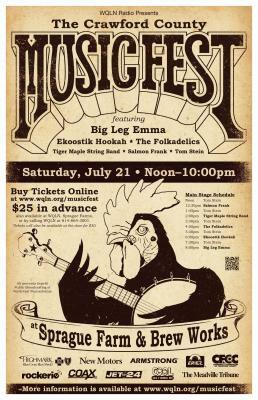 This year's line-up includes five bands, with Ekoostik Hookah and Big Leg Emma as the headliners. The Folkadelics will be making the trip from their home in New York City to play, and Tiger Maple String Band, Salmon Frank and Tom Stein will also be there for some ol'-timey fiddling and finger picking. "I've known Tom Stein and the folks from Tiger Maple String Band for about 30 years, and Salmon Frank is at the farm every other Friday," says Brian Sprague, co-owner and operator of the Farm and Brew Works. "So we have some legitimate people from Crawford County that will be here to play. It's nice to have local musicians represented – there's a lot of talented people in our pool." According to New, WQLN's audience is primarily over 50 years old, so what the people want, the people get. "We're trying to recreate an old hippy experience they would have had as a part of the Woodstock generation." But what about the young bucks who appreciate some good tunes, too? "We want to get younger generations to come so we can say, 'See, this is what it was like, boys and girls!'" While you're moving and grooving to sounds that never go stale, you can also check out vendors that jive with the MusicFest vibe. One group from Nashville will be caning chairs, while another, the Crawford County Country Carvers Carving Club (I dare you to say that five times fast! ), will be, yes, carving and whittling crafts, such as utensils and tools. To compliment the Appalachian Mountains art, food vendors will be serving some down home delicacies. 3B's Saloon will be barbecuing, a vendor from Warren will be dishing up Native American food, and there's even Mediterranean – because the boys and girls need to eat. Oh, and let's not forget the jars of beer, all a flowin' with Sprague's specialties that can bridge any age gap. "A lot of people north of the farm don't get that it's an unbelievably unique place," says New. Not only did Brian Sprague and his wife Minnie renovate the century-old barn that houses the tap system, they also pour estate brews, or beers that are made from ingredients grown and processed on location. Sprague's offers four different estate brews, such as their "HIGH-PA" IPA, which is making an encore appearance after being a hit last year. "The best part is that we're actually making a product that we can enjoy with others," says Sprague. "It brings people together." WQLN's fundraising approach for the music festival is on par with Sprague's grassroots feel. According to New, one week's worth of pledge driving is equal to the one-day brew festival they held this spring at the Brewerie at Union Station. The idea is to fundraise in a way that can keep the airwaves open while engaging the community. WQLN is taking a similar approach with the "10 People, 10 Tickets, 10 Days" contest. For every 10 MusicFest tickets you sell, a MusicFest T-shirt, VIP pass and ticket will come back your way. Tune in to WQLN for more information on 91.3 FM in Erie, or 106.1 FM in Meadville, or contact Tom New at tnew@wqln.org or 814.217.6027. Accommodations for the festival are available at Sprague Farm. Groups can rent out the Sleeping Leaf Lodge, the farm house on the property, or bring a tent and camp out on the two-acre field adjacent to where the festival will be held. You can reserve a campsite in advance by calling 814.398.2885 or emailing kegofsprague@coaxpa.com. If you want to support your local brewer and radio station, and are a fan of American Roots music that leans more toward, as New so eloquently positions it, "Oh, I don't know, Joni Mitchell, earth shoes, and tie-dyes," make your way to Sprague Farm for this year's MusicFest.